Why we should publish even more. Rebekka studied art history, economics and modern history. Her works in critical theory, practice and making as critique evolve on the intersections of experimental publishing, socially engaged art, design, and cultural sciences. She has been teaching at several academies/universities - among others Institute Hyperwerk FHNW HGK Basel and SPEAP Science Po Paris - is a part of Depot Basel team, and is involved in a variety of curatorial, research, and experimental publishing projects with diverse collaborators. Publishing, understood as a process of ‘making a public’1  The differentiation between ‘making public’ and ‘making a public’ was defined by Paul Soullelis: ‘Posting is usually “making public” but publishing is “making a public” by creating a space for the circulation of discourse.’ In Paul Soullelis, ‘Making Public’ (2015), p. 16, available at docs.google.com (accessed 26 November 2017).that informs a ‘capacity to act’,2  Markus Miessen and Anton Vidokle, ‘Capacity to Act,’ in: Caring Culture, ed. by Markus Miessen and Andrea Phillips (Berlin: Sternberg Press, 2011). has the potential to develop as an institutionalizing means, an interface for connecting people with different backgrounds, and as a way to relate with each other. It can be used as a means for instigating critical discourse and engagement, for proposing alternative value systems and opening new political horizons. It even can be pursued as a spatial and spatializing practice, and a site-specific method for investigating contemporary and future living environments. Publishing conceived like this can (and must) counteract prevalent notions of publishing, and some questionable developments within the established publishing world. 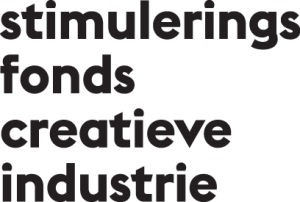 This essay will elaborate on the community-forming and spatializing potential inherent in an unconstrained publishing practice and illustrate it with two cases: a publishing initiative by students and tutors of the HyperWerk Institute of FHNW Academy of Art and Design, Basel and a publishing workshop in Pula, Croatia. Within the established publishing world several mechanisms have emerged over the past few years that require critical reconsideration. One issue is the way it favours profit: this results – due to the industry’s generally low margins – in an accelerated publishing process, in which the aim of maximal coverage, output and profit combined with lower wages, outrank the quality of the contents, and prohibits critical discourse and in-depth research. Newspaper publishers’ dedicated investment in problematic ventures of cross-financing (e.g. trough sale-platforms) result in a lower entrepreneurial and ideational regard for the journalistic product. Technological possibilities within a commercial publishing field are primarily regarded as a potential means to boost profits and coverage, by for example the integration of multiple media; at the same time publishers are eager to keep customers locked into the closed worlds of a particular application or brand. In academia, knowledge is shut away behind paywalls; the reputation of a journal’s name is considered a more compelling quality feature than the article itself.3  Philipp Moriarty (2017), ‘Addicted to the brand: the hypocrisy of the publishing academic’, available at blogs.lse.ac.uk (accessed 26 October 2017). Preclusive sales and distribution networks (and standardized library and archive systems) are reigned and protected by the big players of the publishing industry. We are also confronted with a petrified and rigid segregation of the roles and tasks of the publisher, author, editor, designer, and others. The resulting division of labour, combined with the precariousness and the restricted time frames inherent in publishing work, leads to an outsourcing of tasks to service providers outside the publishers’ subject area, and to a shift from salaried employees towards tasks being subcontracted. These factors work against any efforts, concerns and visions of those involved in publishing from permeating beyond the assigned duty of designing, writing and printing a product. Despite an increasing awareness of these problems, the discussion about possible prospects of a renewed publishing practice still evolves within surprisingly conventional boundaries. Traditional perceptions of roles, processes, temporalities and aims affiliated with publishing processes prevail. It seems that many actors fall into the trap of involuntarily reproducing and perpetuating the established publishing world’s most criticized mechanisms under slightly different terms. But to achieve an attitude that may advance publishing as a critical practice with a transformational impact, and establish it as a means to open a potential space beyond objectification and externalization, one needs to recognize that the prevalent notion of publishing cannot be contested nor overcome as long as it evolves within the regime of the criticized matter, as criticism from within can only result in a vigilance, which remains – due to its continued affiliation to the system – delusionary and ineffective. With this in mind, we could see publishing as a ‘destituent’ way of thinking and acting. A destituent approach, according to Italian philosopher Giorgio Agamben4  Camillo Boano, The Ethics of a Potential Urbanism: Critical encounters between Giorgio Agamben and architecture (London: Routledge, 2017). Retrieved from routledge.com suggesting an ’inoperative architecture standing as a new manifesto for action’. is a reflection and activity in opposition to the constituent power of the dominant narrative, an ‘action that enables us to probe the possibilities of forms-of-life outside the governmental apparatuses and dispositifs’.5  Ibid. The dispositif in Agamben’s terminology is anything that has the capacity to capture, orient, determine, intercept, model, control, or secure the gestures, behaviours, opinions, or discourses of living beings. A destitutent publishing practice is one in which preconceived ideas, orientation and evaluation grids lose their binding power. As a substrate of the tangled universe of Agambenian thinking, a destituent practice of publishing might include the following: it would acknowledge that publications are always embedded in major institutional, social, economic, cultural and technological contexts (forming part of Agamben’s governmental apparatuses) that have the tendency to limit the autonomy of the work; but in all activity that it performs, it would strive for a subtraction from exactly those apparatuses. Particularly it would seek to free itself from the prevalent notions of what publishing should be, from the constraint of producing object-commodities as well as from the prevailing mechanisms, roles, objectives and temporalities. A destitutent publishing practice is one in which preconceived ideas, orientation and evaluation grids lose their binding power. It is informed and driven by immanent dis-sensus, generic disobedience directed against the totalizing (and enticing) power of established modes of perception, evaluation, tropes and aims. It rejects petrification, labelling or codification of any sort. It fosters a generic suspension of ontologies and epistemologies, and constantly aims to reconfigure its own matrix of reference; it is generically willing to imagine completely other strategies, processes, modes of distribution, and contents to what is broadly endorsed. It thus preserves a constant definitional crisis for its own nature, and is nourished by the aim of thinking and acting beyond the ‘real’, beyond what is currently embodied and materialized. It is fueled by the will to acknowledge that truth is not something passively received from a superordinate entity, but is a matter of performative creation. Driven by these objectives a destituent publishing practice pursues a shape-shifting strategy just a ‘little bit different’,6  Ibid. in order to create new forms of knowledge about the principles, preconditions, ethical implications and cognizances of publishing; and – equally importantly – to explore and sustain its sociopolitical potential. The destitutent publishing process that will be conceived and elaborated here depends on the recognition of publications as frames rather than containers and thus harnesses the quality of the publishing sphere as a ‘social nexus’.7  Annette Gilbert (Ed. ), Publishing as Artistic Practice (Berlin: Sternberg Press, 2016), p. 26 It draws from publications’ capacity as institutionalizing or social objects, meaning that they are able to instigate rhetorically active and social spheres embedded in and constructed out of a discourse, 8  Ibid., p. 26 as Annette Gilbert remarks. Soullelis criticizes the often simplistic perception of publishing as an act of ‘making public’. This concept does not take into consideration that notions of public and private are increasingly vague, controversial spheres; it bluntly presumes the existence of an indisputable public, which can be addressed as a social totality. A concept of publishing framed in this manner is prone to favour a broad, nondirectional, unfiltered proliferation of information. Instead he proposes a differentiation between ‘making public’ and ‘making a public’. He explains: ‘Posting is usually “making public” but publishing is “making a public” by creating a space for the circulation of discourse.’9  Soullelis, ‘Making Public’, p. 23 Whether the public is created for the circulation of discourse in order to make a publication (in this case the agents involved in the publication process are at least partially congruent with the public) or by the publication itself is irrelevant. In both cases the publication takes the role of a social or institutionalizing object instigating a ‘rhetorically active (public) sphere embedded in and constructed out of discourse’.10  Gilbert, Publishing, p. 26 Soullelis – calling for a critical reconsideration of the possibilities and inherent qualities of publishing – acknowledges that an audience, a public, does not exist per se but is always a ‘cultural artefact’ that must be created in a deliberate and ultimately performative act. It follows that publishing spheres as they are conceived here only exist with and for a particular audience 11  ‘A public (…) exists only as the end for which books are published, shows broadcast, websites posted, speeches delivered, opinions produced. It exists by virtue of being addressed. (…) The public emerges from the conversation, whether it’s the chatter of a DJ or a poet performing a new work. And this is key for us, as an institution, that “a public” might be a self-organized form that does not exist outside the discourse that addresses it. The discourse forms a public by virtue of being addressed – looking at it this way, making a public is performative.’ Soullelis, ‘Making Public’, p. 16 and by their very nature have an ephemeral character. It is evident that the publication itself – conceived as a motive and programmatic device for community building and as instigator, condenser and frame for discourse – while far from being negligible, is taking on an auxiliary role. Its formal properties and shapes are, as we will read further below, defined within the process rather than ‘dictating’ its course, and can be anything from book to speech act. As publisher and pedagogue Eva Weinmayr indicates in the title of an instructive article, ‘One Publishes to Find Comrades’.12  Eva Weinmayr, ‘One Publishes to Find Comrades’, in Oliver Klimpel (ed. ), The Visual Event, an education in appearances (Leipzig: Spector Books, 2014), pp. 50–59. Available at evaweinmayr.com (accessed 14 August 2017), p. 59. Indeed. But the community-forming property of publishing processes and publications – their capacity to spur collaborative yet agonistic processes of negotiating, gaining critical awareness and filtering information – is not exhausted in a networking effect nor should it be underestimated as a mere instigator of communities of interest. Rather, if publishing draws on its emancipatory potential, those discursive communities – in which knowledge and action are jointly developed as a social good, and which transgress the limited scopes of traditional publishing ventures – can be used as a frame to experiment with a renewed understanding of the nature and aims of publishing. And not only this – publishing can also form spheres in which (counter-) discourse is produced and spread by (counter-)publics: within destituent publishing untertakings, those individuals or groups whose voices would otherwise be suppressed and marginalized by the existing social order, can find a shared thinking-frame, a mutual base for action, and a common voice. They may imagine, devise and performatively anticipate alternative publics and public spaces and partially also realize them. In this regard Weinmayr quotes Matthew Stadler, the founder of Publication Studio: ‘It is imperative that we publish, not only as a means to counter the influence of a hegemonic “public”, but also to reclaim the space in which we imagine ourselves and our collectivity.’13  Ibid., p.59. Space here can refer to both an abstract sphere and a material space. Anyhow the community-forming property of publishing processes and publications bears a spatial or even spatializing trait. It provides a part of the infrastructure of a discursive, counter-hegemonic sphere, in which a possibility beyond the actual state and potentiality are preserved and promoted. Those spheres are independent, in principle, from any physical situatedness. But of course, such a destituent, discursive sphere also relates to the manifold abstract and concrete spaces that surround it and with which it is interwoven: political and economic conditions, historic, cultural, legal and technological contexts and individual backgrounds and convictions. Even though it anticipates an alternative public sphere and reclaims abstract and physical space for its realization, the involved actors are also aware of the contradictory mechanisms of its specific origin and context. It is embedded in, yet keeps a critical distance from dominant narratives and cultures, and it is able to transgress them by forming a conceptual or physical space locally inside and conceptionally outside the environment in which it is situated. In fact, the very contradictions inherent in a publishing site conceived as a counter-hegemonic conceptual sphere partially conflating with a physical space determined by its functions, laws and protocols, can affect and advance the negotiation of rules, roles, narratives, knowledge and agency. They open a space for action and reflection, in which unusual encounters and discourses are possible, and in which the unplanned is more important than projectable material outcomes. Publishing sites conceived like this can be seen as spatial proxies, decoys or surrogates. They are a sort of ‘ghostly presences’ produced by those structures of belief and technological systems they are ultimately challenging. They are weaving within the negative space produced by those systems but also exceeding them, since they not only allow a diagnosis of the contemporary political, societal and technological grounds but are also ‘laboratories’ to develop a potential set of tools for their transformation. A destituent publishing practice by definition remains a vague space; it produces an experience of groundlessness, which requires, in the words of Paul Benzon, a ‘tolerance for ambiguity’.14  Paul Benzon, ‘On Unpublishing: Fugitive Materiality and the Future of the Anthropocene Book’, in: Gilbert, Publishing, p. 168. Nonetheless operating on such vague terms asks for a certain framework, whose premises can be crystallized out of the work of writer and publisher Michael Bhaskar. Bhaskar in his book The Content Machine devises a conceptual framework for publishing activities. He suggests that along with the content, which is prerequisite for publishing, the activities of filtering and amplification are the constituent elements of every act of publishing. Filtering, in his conceptualization, is a collaborative process of thinking about why and when information is gathered, revealed, distributed, manipulated or suppressed. It questions the economic systems, the technological, political, and social mechanisms underlying a specific publishing undertaking, and it demands that the actors involved in a publishing process negotiate their own position and liability within these structures. Amplification, in Bhaskar’s context, is not validated by scale or by maximum reach, which are top priorities for many publishing ventures. At a conceptual extreme, as noted by Annette Gilbert in her extensive volume Publishing as Artistic Practice, if a publication at the moment of its release would only reach one figure more than those involved into the publication’s becoming, amplification has been achieved.15  Michael Bhaskar, The Content Machine. Towards a Theory of Publishing from the Printing Press to the Digital Network (London, New York, Delhi: Anthem Press, 2013), p. 18. In the activities of filtering and amplification, for Bhaskar, there is no randomness. They are not executed in a vacuum, but are conducted within frames according to models. While the frames capture the ‘presentational or performative aspect’ (they don’t just deliver the work but deliver it in a certain frame that can be anything from printed matter to speech act – and with a certain intention), the models encompass the ‘interplay of causal factors, goals, motivations and subjective ideological underpinnings that shapes and provides the raison d’ être for content’. 16  Ibid., p. 18. By freeing publishing processes from their ‘ideological frills’ and reducing them to their structural foundations, Bhaskar distances himself from a prevalent notion of publishing. He rejects the slick-ified outcome, the definite result. Instead he harnesses the potential of the un- or not-yet-defined elements inherent in every publishing process. 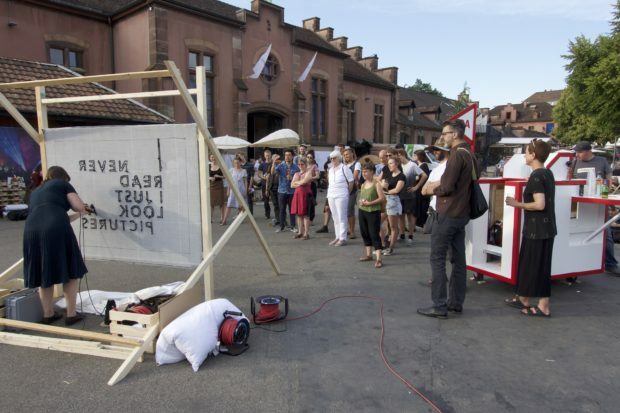 These ideas informed the concept of the ‘DAFestival,’ (the German DA translated as ‘here’ or ‘present’ was the annual topic of Institute HyperWerk FHNW HGK, Basel which took place in Hamburg in late August 2017, initiated by Jan Knopp, Olivier Rossel and Michael Tatschl together with Institute HyperWerk FHNW HGK, Basel and Sedici Verlag.17  Sedici Verlag is a publishing house founded and run by HyperWerk students, alumni and tutors Sedici Verlag propagates publishing as a conscious and intentional performative act of creating a public. Publishing is the frame in which students can experimentally approach methods of research, archiving and communication; furthermore they are encouraged to question the cultures and narratives they are – at least partially – determined by in their everyday world. During the DAFestival, a multi-day event functioning as the diploma publication for the graduating class, the students were asked to disregard the usual restrictions of institutional and academic exigences, in order to ‘translate’ their diploma theses for general consumption by festival visitors. In this way they created new discursive communities beyond the usual addressees of graduate work. Be it through publications as space interventions, sound installations, readings or flyers, they hoped for publics to emerge ‘by virtue of being addressed’. The final rehearsal for Hamburg took place during the ‘I Never Read’ book fair in Basel. And although the students in their presentations departed from common formats, a public emerged for each of the diverse publishing acts and got involved in a discourse surrounding these ephemeral publications. One such performance was ‘I Never Read. I just Look at Pictures’, a live tufting performance introducing an old textile craft performed by a manually steered robot. It involved passers-by not only in the co-creation of a rug but also in discussions about the topics of the thesis. During ‘Presence Raum’ – a performance reflecting on the nature and effects of the White Cube by creating an ephemeral space through sound and physical elements – children and elderly people danced together. ‘Geranien gegen die Entwurzelung’ (Geraniums against Uprooting), a work on territorial and corporeal borders, asked people to ‘give a home’ to geraniums, alluding to this plant’s large diversity – in habit, shape and size – and it’s African origin. The plant’s status as the darling of Swiss balcony gardeners was contrasted with the generic fear of the unknown, the foreign. 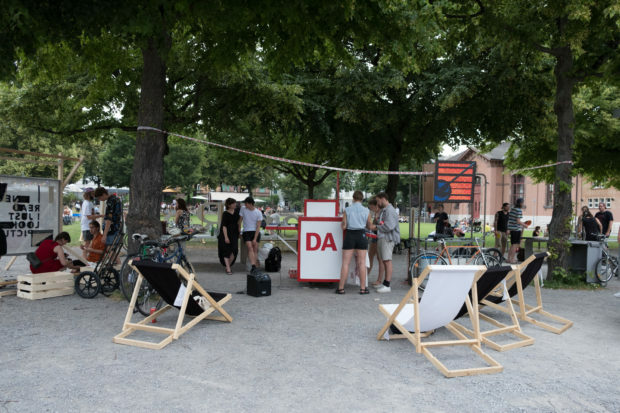 At the DAFestival, the students intervened not only performatively but also physically in public space – for example through a publishing station manufactured by the students and serving as a stage, a speaker’s corner, a bar and a display. During the three festival days a physical space (of circulation and gathering) was claimed and formed that only in parts corresponded with the fair’s ground, and a public emerged, which overlapped with but was far from congruent with the book fair visitors. Creating an audience and abiding within a temporary discursive public sphere – during the publishing process as well as at the moment of the publication’s release – presuppose the existence of a minimum common understanding among the participants. This can be shaped and established within a discursive process evolving along the fixed parameters, which, according to Bhaskar, constitute publishing. The questions inherent to every publishing undertaking – Who is speaking? To whom? About what? How? Who has the power to define? How is information gained, evaluated, selected, processed and spread? – determine the perspective with which participants approach any given topic. Tasks, roles and positions are constantly negotiated and assigned among the protagonists, reflected and re-distributed within the publication process. By negotiating the influenceable elements of the models, the parameters and perspectives for filtering, and the suitable frames for amplification the involved actors develop not only a common language and an understanding for each other’s perspectives, but also a shared set of publishing conditions. The spatializing capacity of making a public can evolve both in an abstract sphere and a material space. This article, however, focuses on publishing as a site-specific method for urbanist research and on the community-shaping aspect of publishing processes – suggesting places where agents can physically organize and exchange to develop non-traditional, hybrid practices – for example, creating publics ‘through physical production, digital circulation and social gathering’.18  Gilbert, Publishing, p. 26. And it accords with Paul Soullelis’s observation of a reversal in the perception of relations in the digital and physical sphere: whereas the internet was formerly used as a means to sustain and amplify relationships established in physical space, out of the same motivations communities formed in the digital sphere now aim to come from the network into physical space.19  Paul Soullelis in an interview at MISS READ 2016 (accessed 25 July 2017). A ‘community coming from the network into space’ also constituted the participants in ‘Publishing Acts’, a publishing experiment organized by the Association of Architects in Istria (DAI-SAI) and Future Architecture Platform, conceived by Ana Dana Beroš, Emil Jurcan, and myself, and conducted as a multi-day workshop in Pula, Croatia. It partially took place on the premises of Praksa, an engineering cooperative for design, urbanism and architecture running a screen printing press – an organization that Emil Jurcan is part of. The workshop connected an international group of architectural editors and practitioners from Pula and other parts of Croatia, all interested in exploring and developing publishing as a process of site-specific ‘making a public’ and harnessing it as a urban practice, a method for investigating contemporary and future living environments, and as a tool for a critical sociopolitical spatial engagement. Publishing in this experiment was understood and explored as a frame for observation, research and discussion, and as the means to inform a process of connecting and re-connecting with a place, in this case Pula, by reviewing its history and cultural context in a specific and conscious way. From their respective points of view and against the background given by the parameters of the publishing proposition, the participants collaboratively explored the territorial, economic and sociopolitical situation of the city. By negotiating the influenceable elements of the models and the suitable frames for filtering and amplification they developed a shared set of publishing conditions, created a common understanding and level of approach; and devised a suitable publishing medium. They surrendered control and embraced coincidence as a reasoning voice and an equal agent in this discursive sphere. In this way, they intuitively opposed the all too common use of the publication as supervisory and leveling device where knowledge circulates in closed spheres and is processed exclusively among peers. It stands to reason that an ad hoc and multi-vocal exchange like this is always also an encounter with the possibly unknown and incomprehensible. The potentially inscrutable is neither abolished nor negated in the discourse. It is an integral part of an intimate connectedness, which occurs in processes of sharing, translating and negotiating one’s own position against the background of the other. Such considerations call for the allowance of different voices in the publication process as well as in the publication as such. The students of HyperWerk, for example, embraced this idea by including random generators, such as the wheel of fortune or drawing lots, into the spatial model of publishing processes they developed during a workshop to avoid stand-offs in negotiation processes. They surrendered control and embraced coincidence as a reasoning voice and an equal agent in this discursive sphere. In this way, they intuitively opposed the all too common use of the publication as supervisory and leveling device where knowledge circulates in closed spheres and is processed exclusively among peers. Furthermore they broached a subject relevant beyond the publishing sphere, namely the significance of embracing impulses that exceed human reason, of exploring and developing forms of agency beyond anthropocentric world views – such as the possible agency of machinic entities and other ‘beings of the earth’.20  Donna Haraway, Staying with the Trouble: Making Kin in the Chthulucene (Durham and London: Duke University Press, 2016), p. 3. In Pula the ‘foreigners’ through the exchange with their hosts gained some local knowledge, and were not bound to adopt a touristic and external view, but they of course remained, to some extent, outsiders. The locals, on the other hand, re-encountered their city through the eyes of experts from abroad. The participants of the Pula workshop related within a discursive publishing sphere thus had to shift from their usual perspectives and adopt a kind of in-between position. From there, preconceived ideas, orientation and evaluation grids as well as the official narrative of industrialization and tourism violently put forward by the city, lost their binding power. A destituent publishing practice in an Agambenian sense gains momentum from existing between two states. All activities performed as destituent publishing in the present are, as stated above, informed by a future to come. Within them a possibility beyond the actual state and potentiality21  To illustrate the connection between Agamben’s notion of ‘potentiality’ and publishing, Katie Paterson’s Future Library might be useful: the artist planted a forest in 2014 and founded a library (not yet open to the public) for texts that will be submitted year by year by known authors over a period of 100 years. These texts will be made accessible to library visitors and published in 2114 – printed on paper from the trees of Paterson’s forest. ‘In this constellation of delay that offers neither amplification, distribution nor access, the texts inevitably remain ‘in a limbo of potentiality,’ as Annette Gilbert remarks (Publishing, p. 30). are preserved and promoted. 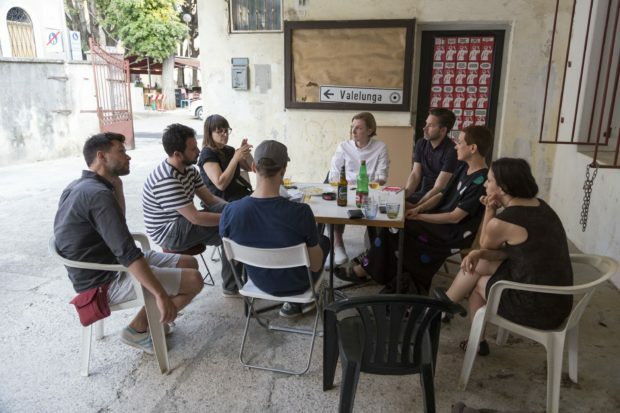 During the publishing process in Pula the participants embraced the uncertainty and acknowledged that in its spaciousness there is room to act towards a future to come – embracing the unknown and all the paradoxes, opacities and open endings. During city walks and editorial working sessions awareness met naïveté, experiences interspersed with impressions, perceived realities mixed with playful speculation. The willingness to embrace insecurity and speculation not as obstructive but as rewarding factors constituted a publishing sphere as spatial proxy – situated locally inside but conceptually outside the official narrative of Pula, a space to imagine and push forward completely other strategies, aims and agencies to what is broadly endorsed. A destituent perspective like this cannot do without investigating historically grown hegemonic and hegemonizing entities: in order to challenge the present one has to trace the offspring of its prevailing narratives, their entanglement and proliferation and explicate the forces that determine it. As McKenzie Wark writes in his Molecular Red reader: ‘Sometimes to take three steps forward one has to take two steps back, back into the archive, to find the materials for going on, but in a new way.’22  McKenzie Wark, Molecular Red: Theory for the Anthropocene (London, New York: Verso, 2015), p. 4. He calls for a reconsideration of canonic theoretical and historical resources and to replace or confront them with sources that were marginalized in historiography but might still be adequate to understanding the present. ‘We need new ancestors, and new ways to read our contemporaries.’23  Ibid., p. 4. In Pula, this way of thinking was encouraged by asking questions such as: How can we rewrite the predominant narratives and politics? ? Which stories do we have to tell in order to engender new public realms? How do we instigate new narratives and forms of agency beyond the institutional, popular or historical canon? And how do we allow destituent infrastructures to grow? 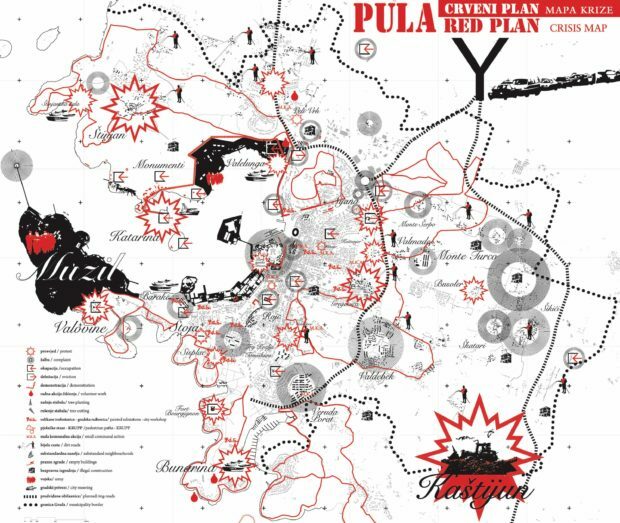 An important source of inspriration was the Red Plan of Pula created by Pulska grupa, produced and distributed by Praksa. Their publishing practice alludes to the sphere of samizdat or zine (self-)publishing as a way for censored writers, thinkers or underground artists to disseminate their critical, anti-hegemonic perspectives. This map lays out an image of the city in the age of late capitalism by delineating and categorizing events according to activity types, including revolts, demonstrations, complaints, occupations, evictions, unauthorized construction, small communal actions and volunteer work. The map also shows points of potential future conflicts, such as abandoned buildings in the city, substandard settlements and dirt roads, as well as important roads still in planning stages.24  praksa.hr (accessed 24 July 2017). It has been widely distributed, including at the city’s tourist office. The map, combined with the idea of infiltrating the archives with new ancestors and adding new affordances to future archives, gave the impulse for the participants to devise a series of overlapping city maps making visible and naming those experiences that contradict and interweave with the official city narrative of thriving industries and tourism. Incorporated into the contribution Microcities is China Miéville’s science fiction novel The City & The City.25  China Miéville, The City & The City (London: Macmillan, 2009). Analogous to the situation in Pula, the workshop participants used this sci-fi novel, revolving around two fictional cities that share the same physical space, but the inhabitants of each place are forbidden from meeting those of the other, to the extent that they develop the ability of ‘unseeing’ the citizens who do not belong to their hometown. 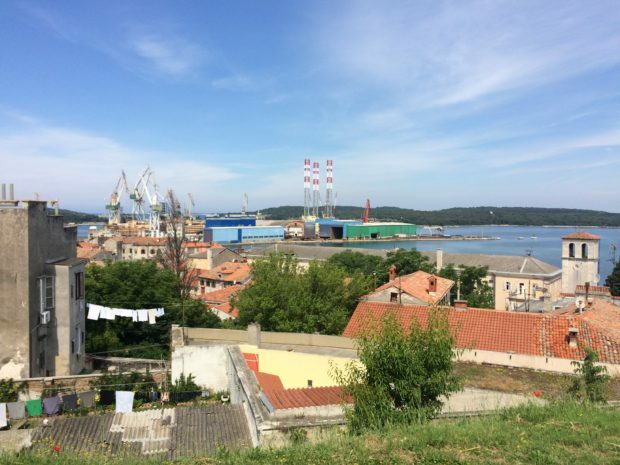 Actively and consciously created temporary worlds like the one in Pula – not utopias but productive sites – can promote plural, alternative communities and also challenge the structures and narratives of the predominant culture. It can be a method to establish agencies beyond officially acclaimed public spheres. Publishing, as Michael Warner writes, is ‘a poetic worldmaking’.26  Michael Warner, ‘Publics and Counterpublics ( abbreviated version)’, in: Quarterly Journal of Speech Vol. 88, No. 4, November (2002), p. 413. Even so, if a sociopolitical imaginary developed within a publishing process is constitutive of a public sphere projected as a temporary and ephemeral world, participants and instigators of these processes must become aware what kind of societies – or kin, in Donna Haraway’s terminology27  ‘So, make kin, not babies! It matters how kin generate kin.’ In: Haraway, Staying with the Trouble, p.103. – could and should emerge from current conditions. This presupposes that any discursive activity must first of all recognize and situate itself rhetorically vis-à-vis the pre-existing projects of ‘worldmaking’. Only through awareness of how their sphere characterizes itself internally and to potential wider publics28  Warner, ‘Publics and Counterpublics’, p. 424. can the agents involved in a publishing undertaking adopt an adequate mode of thinking and acting. Recalling Matthew Stalder’s demand, they can ‘reclaim the space in which [they] imagine [them]selves and [their] collectivity’, which may eventually lead augment their public agency within the predominant public sphere and to ultimately be able to challenge (and eventually replace) it. By all means also physically, as in the case of the mobile publishing station, which was used during the DAFestival to intervene in public space, and reclaim physical and abstract space for diverse, also for so far underrepresented and unheard, publics. A destituent perspective like this cannot do without investigating historically grown hegemonic and hegemonizing entities: in order to challenge the present one has to trace the offspring of its prevailing narratives, their entanglement and proliferation and explicate the forces that determine it. Eventually, to release a publication from the point of view of a destitutent practice results in the need to locate, promote and use destituent infrastructures, public spheres, narratives or imaginaries, but to also to conceptionally and physically expand them. The word ‘release’ illustrates well that every publishing process contains an act of passing on, a moment of losing control. The publication as such here does not claim to be a universally valid or absolute truth, but is an ‘intermediary’ of a discourse. At the moment of the release, it is passed on with a symbolic gesture. A gesture, as a semiotic phenomenon in which the meaning is conveyed through an action or motion, is an input signal, a ‘cause of a performance’.29  Annie Luciani, ‘Gesture / movement / action,’ in Enaction and enactive interfaces: a handbook of terms (Grenoble: ACROE/Enactive Systems Books, 2007), pp. 121–122. A gesture is something preceding an action. In our case it creates a link between what happened before and what is going to happen after the publication; it establishes a mental and emotional connection (of mutual care or interest for a topic or concern), which can trigger a variety of other gestures, actions and motions. The gesture of passing on imparts not only a product, but also information, a concern, a discourse about a certain topic. Curator Nat Muller wrote on this subject: ‘we view the act of publishing as a gesture that accommodates the political, the artistic, and in some cases, the defiant (…) A gesture is something preceding the action, and therefore signifies motion and agency of the most expressive and potent kind, precisely because it is so wrought with intentionality.’30  Quoted in Alessandro Ludovico, Post-Digital Print, The Mutation of Publishing since 1894 (Eindhoven: Onomatopee, 2014), p. 68. These thoughts informed the development of the Pula engagement. The interim result of the publishing process based in Pula has – due to the parameters of the initiative but also resulting from the participants’ individual abilities and preferences – taken the shape of a printed proto-publication. Publishing Acts. Pula Documents cannot be purchased; each of the 40 copies screen-printed by Emil Jurcan and Praksa is passed on by hand to another person. This refers to the practice of political zine production and to the importance the symbolically charged ‘act of passing on’ was given in this project. The discursive sphere that emerged among the guests of the publication’s launch at the Museum of Architecture and Design in Ljubljana during the Breaking Down The Walls Festival served as an occasion to think about possible further developments of the initiative ‘Publishing Acts’. The idea is to pursue it within a series of residencies, in which publishing will serve as a frame and interface to connect local initiatives, citizens and the residency’s guests within a common exploration of the territorial, economic, historic and sociopolitical situation. Such a project could be harnessed as a means to question and challenge prevailing narratives and perceptions, potentially leading to radical transformations of built territories. It can only be considered as a tentative step at the beginning of the long journey, which the task of developing publishing as a transformative, spatializing and spatial practice implies. But, to conclude with Agamben: developing destituent practices might form the base for a ‘coming community,’ a form-of-life, ‘a life which is lived immanently and therefore not reliant upon dispositifs to be constituted, nor any form of transcendence’.31  Boano, Ethics of a Potential Urbanism, p. 17, quoting Tom Frost, ‘The Dispositif between Foucault and Agamben’, in Law, Culture and the Humanities; article first published online: February 16, 2015. A form-of-life presupposing the emergence of ephemeral communities of kin, which, through the rejection and immanent overcoming of sovereignty, are able to convert exclusion into autonomy. *The top image features an illustration by Selim Projects The Post-national Biennalisation Map published in: Ana Dana Beroš, Rebekka Kiesewetter, Emil Jurcan (eds.) (2017). Publishing Acts. Pula Documents, Pula: Praksa.